1st Annual Workshop on Workplace Humor SUCCESS! 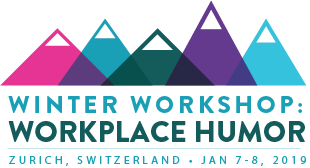 We recently welcome 20 international experts and early career scholars for our first annual winter workshop on workplace humor at the University of Zurich in Zurich, Switzerland. Cecily Cooper (Miami Business School) and Brad Bitterly (Michigan Ross) presented their recent workplace humor work and gave feedback for management scholars, while Paul McGhee (Professor Emeritus) and Tracey Platt (University of Wolverhampton) presented their thoughts on the humor habits and gelotophobia and gave feedback for psychology scholars. Thanks again to everyone for their participation and active engagement! For a summary of the key takeaways, see here. This was created to enhance long-term learning from the event but also as an inclusion initiative for interested persons who were unable to attend. I represented UZH business to develop and organize this interdisciplinary workshop with my super co-organizers Jennifer Hoffman and Christian Kastner (UZH Psychology). Our event was funded by a generous grant from the UZH Graduate Campus. As suggested by our title, we hope to make this a regular event. So stay tuned for details about a 2020 event! On September 21, I presented “Laugh it up? Interpersonal and career effects of humor” in the selective Academy of Management Journal Paper & Idea Development Workshop at ESSEC Business School in Paris La Défense. AMJ editor-in-chief Jason Shaw, deputy editor Marc Gruber (also from Switzerland! ), and 6 other Associate Editors (e.g., Brian L. Connelly, Pursey Heugens, Sucheta Nadkarni, Anthony J. Nyberg, Zeki Simsek, and Balagopal (Bala) Vissa) convened from across the world to provide feedback on 24 international scholars' research. Did you hear the one about the (free) workplace humor workshop? As many of our mentors also study trust, power, status, and leadership, we also encourage submissions on these topics.